On June 7, Stevenson University received final approval for the $1 purchase of the Rosewood Center property. The Arc Maryland hopes this purchase inspires Stevenson University to acknowledge the history of the people who lived in the former Institution as well as to make strides to improve inclusive opportunities for people with intellectual and developmental disabilities (I/DD). You can read the Arc Maryland’s press release on the sale of the Rosewood Center property here. The Rosewood Center was opened in the late 1800s as the Asylum and Training School for the Feeble-Minded, and served as the largest state institution until its closure in 2009. At the Rosewood Center’s peak, 3000 children and adults were housed on the property. The Arc Maryland was instrumental in advocating for the closure of Rosewood, after several investigations of abuse. 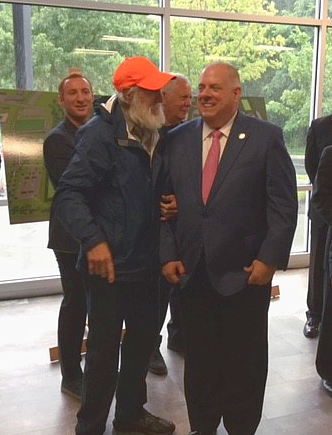 On July 6, Governor Hogan visited Stevenson University to mark the transfer of the 117 acres. You can read a Baltimore Sun article about Governor Hogan’s visit here. While at Stevenson University, Governor Hogan met with survivors of Rosewood, including Wilbur. Wilbur grew up at the institution before his release at the age of 24 in 1974. Once back in his community, Wilbur received support from The Arc Baltimore and became a fierce advocate for the closing of the Rosewood Center. Wilbur continues his self-advocacy with The Arc of Frederick County and works with training the Frederick County Police on how to safely support individuals with disabilities in the community. Wilbur is glad that the property will be put to a positive use, and hopes that Stevenson University builds a memorial to remember those who lived at the Rosewood Center.